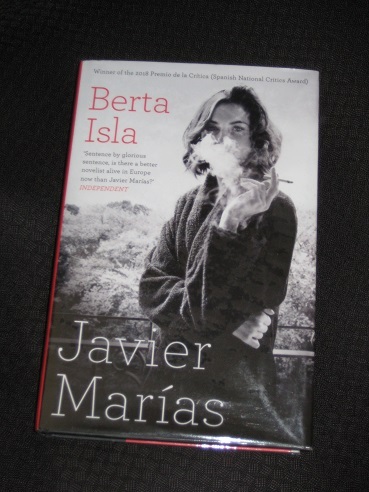 Berta Isla, the latest work from Javier Marías (translated by Margaret Jull Costa), has more than a passing connection to his most impressive novel(s), the spy trilogy Your Face Tomorrow. Once again, we have a multilingual Spaniard, Tomás/Thomas Nevinson, spending time at Oxford University, only to be noticed by retired secret agent Peter Wheeler, who gently hints that his talents might be of great use to his English father’s country. After initially rebuffing these advances, Tom is forced to change his mind when he becomes entangled in an unfortunate affair, with the enigmatic Bertram Tupra the only man able to save him – at a price, of course. I suspect that the many Marías fans out there will be torn on hearing of the Your Face Tomorrow links in Berta Isla. While some will be hoping for more of the magic of the trilogy, others may fear a tarnishing of the writer’s reputation, especially given the relative disappointments (with a strong emphasis on the word ‘relative’) of his last couple of books, The Infatuations and Thus Bad Begins. Luckily, that’s not the case, and just as the trilogy can be read without needing to refer to the earlier All Souls, the world of Your Face Tomorrow is merely a familiar frame within which Marías is able to tell a whole new story, involving two fresh characters. It’s interesting to compare the main man of this book, Tom Nevinson, with Jacques Deza of the earlier novels. The casual volunteer of Your Face Tomorrow is replaced here by a conscripted full-time agent, and even if what Tom actually does is veiled behind a wall of official secrets (whereas the reader was able to follow Deza as he went along his business), Berta Isla offers some fascinating insights into the life of a long-term spy. Certainly, you’re left feeling that Deza made the right call to bow out when he had the chance. The telephonist had said Tomás was away, which suggested that he wasn’t in London. And if he wasn’t in London, then I had no means of locating him, and I really needed to speak to him, to tell him what had happened, and ask him what the hell he was up to and what kind of mess he’d got us into, as well as what his work actually involved, if, that is, they were right, the Kindeláns, whom I did indeed hope never to see again, either in the Jardines de Sabatini or anywhere else. I needed to ask him to arrange matters so that it couldn’t happen again. This isn’t the first time he’s been incommunicado, but at a time when she truly needs his help, she finally realises that he’s not to be relied on. As much as Tom might bluster in defence of his work, Berta has many years to consider his arguments, and she’s far from convinced. Is Tom really any better than Franco’s brutal underlings? Do the ends (‘protecting the realm‘) justify the means? More importantly, if any of this is true, is she really content to only ever have a part of him (and perhaps not even the best part)? However, with Tom out of the way for the most part, Berta Isla is more concerned with how its heroine copes with his absence when it stretches beyond the typical span. She’s in the prime of her life, capable of attracting men with little effort, so believing that Tom is gone may be the best option, allowing her to move on. Yet is it possible to write someone off when no trace of them has been found? For many readers, this will be the most interesting part of the novel, seeing how Berta tackles life in the dark, not knowing whether her husband is dead or alive. I had Just started reading it :). This was my first book by Marias. Your review read like visiting an old friend, but I thought the first 120 or so pages was like meeting a smart but tedious acquaintance; someone whose life is more interesting than his digressions. Thankfully, Berta took over the narrative shortly thereafter and the novel became much more compelling. She is a memorable character – passionate but troubled, challenged yet resilient – whose life becomes a series of painstaking questions. In the end, they are answered but not without the shocks and surprises that bring this novel to its beguiling conclusion. Despite a frustrating start, it was worthwhile if only in showing the humanity of secret lives.